To say that life is challenging in 1812 England is an understatement. Due to the conflict with the French, the economy is struggling and many of those in the small coastal town of Thurlton resort to a second form of income – smuggling. However, smuggling is dangerous; if caught, the culprits could be charged with treason for transporting French goods. If someone is discovered with French goods, there is a hefty fine. Most of the townspeople are aware of the dangers and are willing to take bribes to keep the smugglers’ actions secret, but there is one final threat that terrifies them all – the mysterious Lantern Men who roam the fens, recognizable by their wisps of lantern lights. These mischievous spirits haunt the marshes and lure careless travelers into a watery grave. Ella Winterton has a healthy fear and regard for those who travel through the dangerous bogs and marshes, but when her best friend Kate comes down with an illness that threatens her life, Ella has no choice but to brave the trek through the mist. 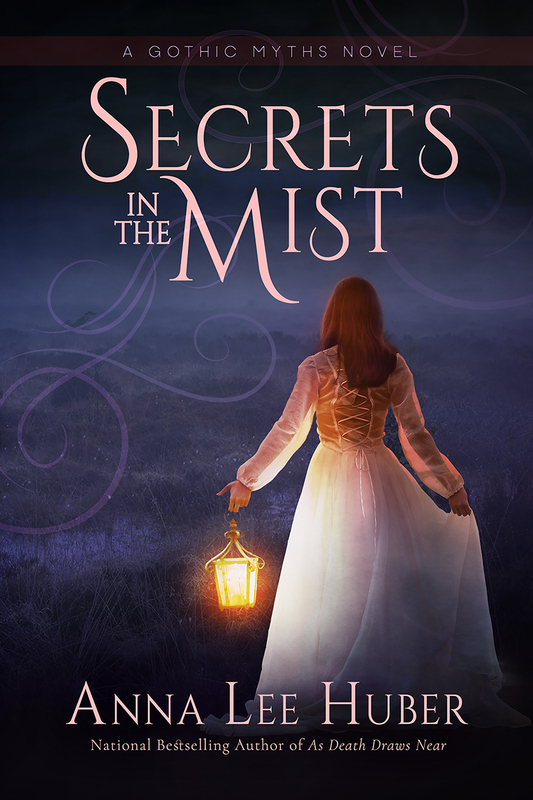 Cautious for hidden bogs and tight twists in the path, Ella focuses closely on her travels when suddenly a dark cloaked figure appears out of the mist. Unsettled by his appearance, Ella is shocked when he allows her to pass by safely. Ella is convinced that the Lantern Man is more man than myth and most likely involved in the smuggling trade. His secret activities create more chance encounters with Ella and she becomes fascinated and unafraid of him. The thought of this mysterious man haunts her mind, but Ella has more pressing concerns to deal with. Since the death of her mother and her brother, Ella’s father spends his days consumed with grief and alcohol. Their home has fallen into disrepair and Ella is forced to sell what she can for survival. When Sergeant Watkins, an officer with the Board of Customs, finds evidence of contraband alcohol in her father’s possession, a hefty fine is levied. With nothing left to sell and estrangement from her parents’ families, Ella is forced to make a decision that threatens her family’s reputation, her home and property, and even her life. As a huge fan of Anna Lee Huber’s Lady Darby mysteries, I admit I was bit nervous and apprehensive about this new series. Would I like it as much? Would it be as good? The answer is unequivocally – yes! Ella is a fascinating and relatable character; the reader feels for her situation but never feels sorry for her. There is a naivety in her attitudes and perceptions but it not the wide-eyed innocence of a child; rather a woman of a certain station whose situation has faced a change in hardship so that she must have honest view of reality. I admire her gumption and initiative but also wanted to yell out for someone to give this poor woman a break! The rest of the characters are rather secondary but have their own individual backstories and motivations. Ella truly drives the novel but it is the other characters who help guide, or divert her, from her path. Huber has stated that this book series will follow in the tradition of Mary Stewart and Victoria Holt. The series has interrelated story-lines but each novel will highlight different heroes and heroines. Any one of these secondary characters could develop into their own new book and I am anxious to see what happens next. The second Gothic Myths book is due out in 2018. According to historical notes on the author’s website, Huber stated that the Lantern Man myth is a real myth; she plans to build the series around some other not-as-well-known myths. I think it will be fascinating to read about the contrast of fact and fiction in them. My interest is definitely piqued! Although the series is different than the Lady Darby books, one can’t help but compare the two. In true Anna Lee Huber form, the essence of the story lives in the development of the characters. Their histories, motivations, and depth make them enduring and the reader becomes fascinated by the lives and adventures they lead. This entry was posted in Book Series and tagged anna lee huber, Gothic Myths, Lady Darby, Lantern Men, Napoleon, Revenue Men, Secrets in the Mist, smuggling on October 25, 2016 by kvgaughan. Local farmer John Tully went out for an evening walk with his young son Eoin. Hours later when he didn’t return, his wife asked his brother Conor to look for him. Conor finds Eoin cold, alone, and scared but otherwise unharmed on the beach but there is no sign of his father. Local gardai and the Irish Coast Guard, friends and neighbors search the Cork coast but there is no sign of John. Then, a few days later, a body washes up on the shore. As the news quickly spreads, there is a surprise discovery: the dead man is a stranger. After the death of her grandmother, Maura Donovan headed to Ireland and discovered that she had inherited Sullivan’s Pub in a small tight-knit Irish community. After seven months, she is still struggling to get her bearings on understanding the intricacies of the local customs, on dispensing of news and keeping community secrets, and on working the heating system in her home. As the pub becomes a meeting place to share news and comfort, Maura senses the undertone that there is more going on with John’s disappearance than is said. Local gardai and Maura’s friend Sean asks her to keep her ears and eyes open. The Garda Siochana, the Irish Navy and Customs, and the National Crime Agency are all working together on something big; rumors of drug smuggling along the coast are keeping them focused but Maura is concerned that John’s disappearance may be unduly linked with the operation. Concern for John and his family overwhelm Maura’s sense of justice and she may be forced to choose between what is right and what is lawful. Sheila Connolly has three different book series that I follow. This is the fourth book in the County Cork series and it is a well-structured cozy mystery. As you know, one of my biggest pet peeves is the plausibility of reoccurring crimes and murders in an unrealistic place. Connelly has done a great job with this series as Maura is the bar keep of a pub that serves as the lifeblood to this small Irish community. Residents stop in daily for a pint before they head home from work and it becomes a place for the exchange of news, gossip, and information. The cast of characters aren’t cartoony as is often found in stories written about certain locales. Billy is a great character who has lived in the town forever and provides a lot of stories and backgrounds. It is believable that Maura would seek out his insight and knowledge. Maura’s employee Mick is personable and yet a bit full of the blarney. I really like how the reader gets to observe the town and its residents through Maura’s eyes and learn about life in her new country as she does. This story also featured a bit of history about Irish whiskey which was also quite interesting! 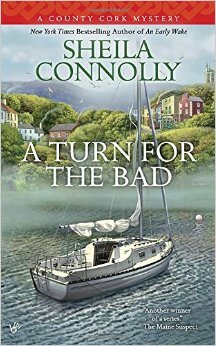 This entry was posted in Book Series and tagged A Turn for the Bad, County Cork mysteries, Ireland, Museum mysteries, Orchard mysteries, pubs, Sheila Connolly, smuggling, whiskey on February 18, 2016 by kvgaughan.